The sandwich press is my microwave oven. Last week I briefly mentioned the use of the sandwich press to grill eggplant slices. Let me elaborate. As I generally try to cook without adding oil, there are certain methods that can be challenging. Grilling and roasting would have to be some of the simplest and most delicious ways to prepare vegetables, but without oil, the risk of ending up with a dry, shrivelled and chewy lump is pretty high. So when I discovered that grilling between sheets of baking paper on the sandwich press is a quick, easy, and tidy way of grilling vegetables to perfection, I was pretty excited. So excited, in fact, that I’ve gone a bit overboard with my sandwich pressing adventures. I’ve tried pressing vegetable burgers – they squashed flat and looked completely feral – but still tasted good. I’ve pressed a banana – again that didn’t hold it’s own, it turned into (deliciously caramelised) banana mush. I’ve found that it only works for things that hold together well on their own. So far the I’ve had the best results when I’ve grilled eggplant slices or mushrooms. When people tell me that they don’t like eggplant, as seems to be fairly common, my response is always “you haven’t had it done right”. Eggplant, or aubergine, is one of those vegetables that is easy to do right, but easier to do wrong. Unlike most veggies, it can’t just be chopped up and sauteed for a few seconds and served a little raw. It must be cooked properly – if even the slightest bit underdone it won’t be any good. When cooked properly, the fibrous white flesh goes from tough, tasteless and slightly bitter to a creamy, smokey piece of heaven. And the sandwich press gets it right, every time. Unlike mushrooms, where I’ll be using the sandwich press on occasion, I’m fairly certain that I’ll be cooking my eggplant on it for the rest of my life. By now you’re probably thinking “this woman needs to get out more”. So I’ll stop raving about the sandwich press and fantasising about eggplant and get to the recipe. My inspiration came from a recipe called ‘Grandmother’s Aubergines’. In my big fat bible of Italian cooking, The Silver Spoon, there is an entire chapter on eggplant (sometimes I wish I’d been born Italian!). I tweaked the recipe a little to fit with what ingredients I had in the fridge, and my personal taste, and ended up with a chunky, colourful medley of eggplant, onion, tomato and parsley. It’s just a bit delicious and while it appears to be the sort of thing to contain a lot of oil, it’s entirely oil-free. Which leaves room in your diet for enjoying nuts, seeds, avocados and other wholly natural, unprocessed and delectable sources of good fat. I made a batch of socca to go with it. If you’re not familiar with it, socca is a dense sort of flatbread or baked pancake made from chickpea flour (a.k.a. garbanzo bean flour, gram flour or besan). It’s high in good stuff and low in bad stuff, exceptionally filling and a great canvas for whatever flavours tickle your fancy. 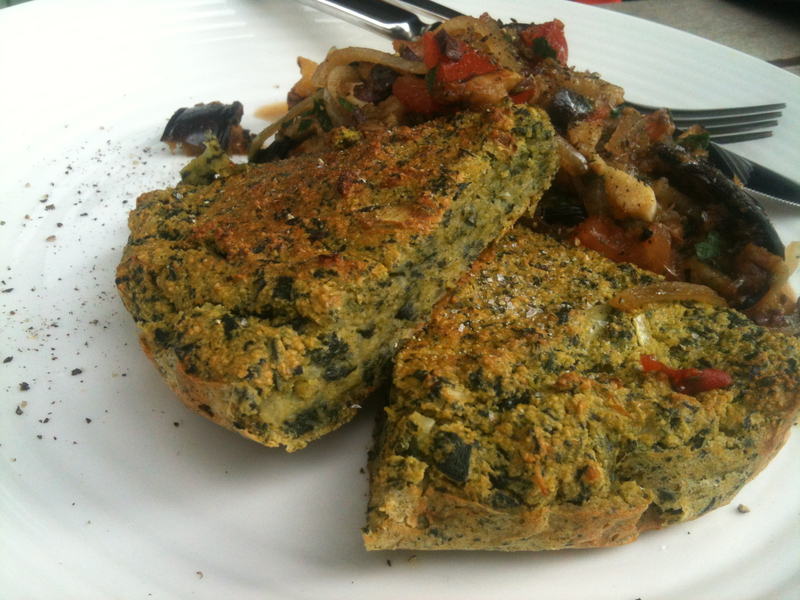 This one had spinach, onion and nooch to give it a complimentary savoury flavour while sneaking in some greens. Not that greens need to sneak around me, ever. I doubt that either of my grandmothers have ever made socca, but this is my version of the recipe from The Silver Spoon. The cookbook is dauntingly hefty, containing over 2,000 traditional and modern Italian recipes. If you’re lucky enough to find a second hand copy for $20 like I did, I would absolutely buy it. In fact, if you’re not as stingy as me, go and buy a new one. It’s a great source of fresh ideas and instruction, and if nothing else, looks damn good on the shelf. Saute the onion in water until translucent. Chop the eggplant roughly. Add it to the onion along with the garlic, tomato, parsley, capers and olives. Turn the heat down and cook for a further 5-10 minutes. Add vinegar and sugar, taste and add a good crack of salt if you feel like it. Serve either hot or at room temperature. If not serving with socca, you could use this as a sauce, bruschetta topping, salad topping, or simply as a snack eaten out of a bowl with a spoon. You can use whatever size or shape tin you like to make socca, just adjust the cooking time accordingly. I intentionally made this batch in a smaller tin so that it was quite thick. I’ve made it in a pizza-tray on occasion, which makes it very thin and crispy. I adapted this recipe. Consider the basic socca mix of equal parts water to chickpea flour a template, check out this page for a huge range of socca ideas, both savoury and sweet. Preheat oven to 150C. Line a 20cm cake tin with baking paper, making sure there aren’t any gaps (the batter is runny). In a bowl, mix the chickpea flour and nooch together with one cup of water until smooth. Mix in the other ingredients and pour into your tin. Bake for 30-40 minutes, or until a little browned on top. Slice and serve. Socca is a bit chewy and moist in the middle, but should not be raw or runny. p.s. Are you getting tired of eggplant recipes yet? I’m not. p.p.s. My food processor has been replaced, again. Brace yourself for hummus. Now I just need my camera back – I’m told it’s on it’s way – yay!